A smile was apparently added to North Korean leader Kim Jong-un’s facial expression in a Sunday night show broadcast on 3 June by Russian state TV Rossiya 1. 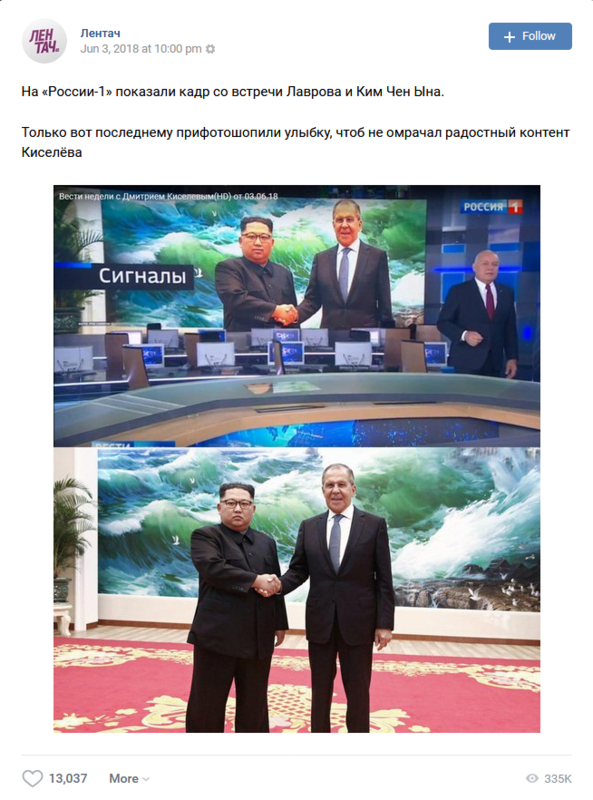 As the independent Russian outlet Meduza, the BBC and other media reported, Russian social media users were quick to question the authenticity of the image, which was used as documentation of Foreign Minister Sergey Lavrov’s visit to Pyongyang on 31 May. A popular Russian online satire account, Lentach, posted a comparison of the official handshake photo with the image that appeared on Rossiya 1 on the Russian social media network, Vkontakte. Lentach: “Rossiya 1 showed a photo from Lavrov’s meeting with Kim Jong-un. But they added a photoshopped smile so as not to cloud Kiselev’s joyful content”. Social media users and bloggers did their best to try to detect the smile in video footage showing the handshake moment, but without success. 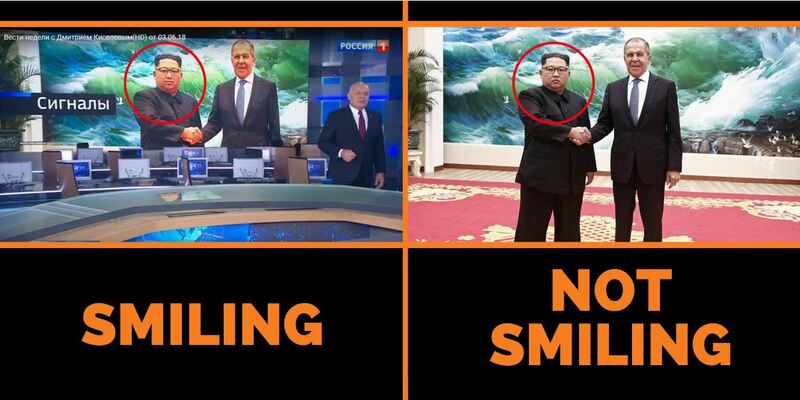 Click on the video and check for yourself if you can detect the smile which appeared on North Korean leader Kim Jong-un’s face when his handshake moment with Russian Foreign Minister Sergey Lavrov was shown on Russian state TV. Ilya Yashin: “They’re testing [the smile] on the gloomy North Korean dictator, but tomorrow they’ll make us all happy. With a joyous smile, Russians will welcome news of price rises, utility rates hikes and subsidies to oligarchs”. It is not the first time Russian state TV channels are accused of having faked images for their stories. In February, Pervy Kanal used a screenshot from a computer game called “Arma 3” in their Sunday evening news show. In November last year, it was Rossiya 1’s sister channel, Rossiya 24, which used computer game images as “irrefutable proof” of US combat troops providing cover for ISIS in Syria. The images, which had been made available by Russia’s Defence Ministry, turned out to be screenshots from “AC-130 Gunship Simulator: Special Ops Squadron”. 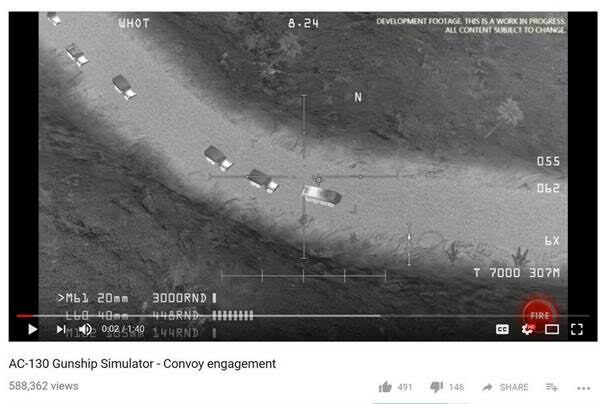 The state TV channel Rossiya 24 and Russia’s Ministry of Defence presented this image from a computer game as “irrefutable proof” of alleged US cooperation with ISIS. 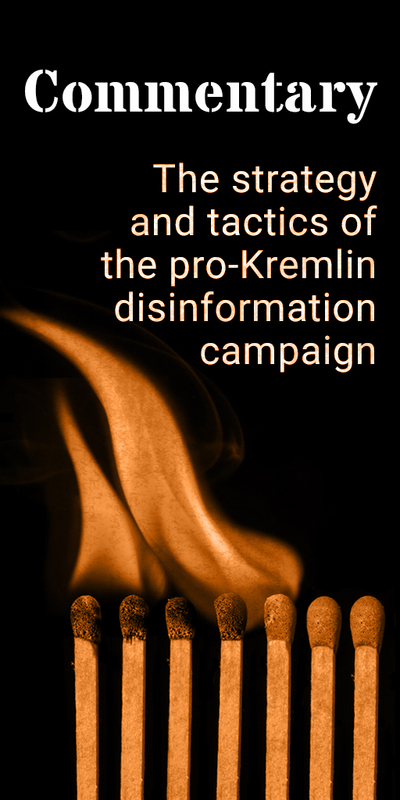 The case comes on top of more than 100 examples of disinformation from Mr Kiselev’s Sunday night show Vesti Nedeli (“News of the week”), which have been included in our database of pro-Kremlin disinformation. 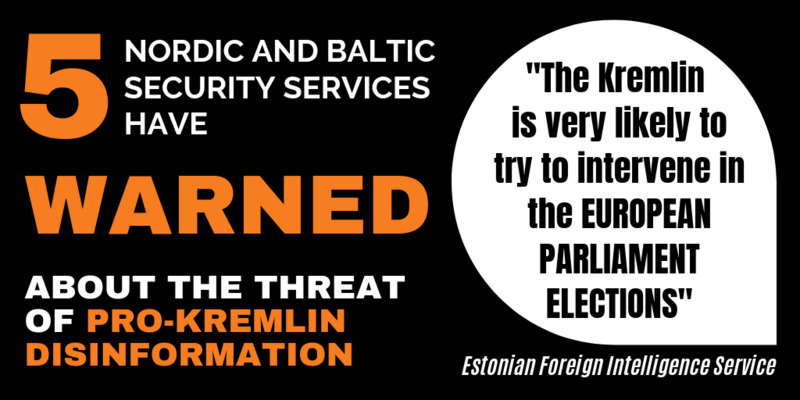 Video games as "irrefutable proof"
Watch our video with examples of computer games presented as authentic documentation in pro-Kremlin disinformation.